The corn earworm (CEW), also known as the tomato fruitworm or cotton bollworm, is a pest of corn, tomato, cotton, beans, alfalfa, and tobacco. CEW overwinter more successfully in southern Indiana and are more likely to be an early season problem farther south. However, early plantings may be attacked throughout the state. Corn maturing in mid-season is less likely to be injured, because CEW is between generations at that time, however monitoring moth flight is important. CEW larvae grow to be nearly 1-1/2 inches long when mature. They vary considerably in color from light green to tan, brown, pink, maroon, or nearly black, with light and dark stripes running lengthwise on the body, which is lighter on the underside. The head capsule is light brown. The larvae will feed on foliage, but prefer to feed on the more nutritious tips of corn ears, tomato fruit, and bean pods. CEW larvae usually enter corn ears only through the tip, not through the side or shank as European corn borer and fall armyworm. The CEW moth, with a wing expanse of about 1-1/2 inches, is buff colored with irregular spots and markings on the wings. The front wings have a dark “comma” shaped spot that is more prominent on the males. The yellowish eggs are small, about half the size of a pin head, and are laid individually. Fresh corn silk is the preferred egg-laying site for the moths. The eggs hatch in 2-5 days, depending on temperature. Shortly after hatching, the young larvae follow the silk channel to the tip of the developing ear, where they feed, consuming kernels and fouling the ear with excrement. Once the larva has entered the ear, there is no effective control. 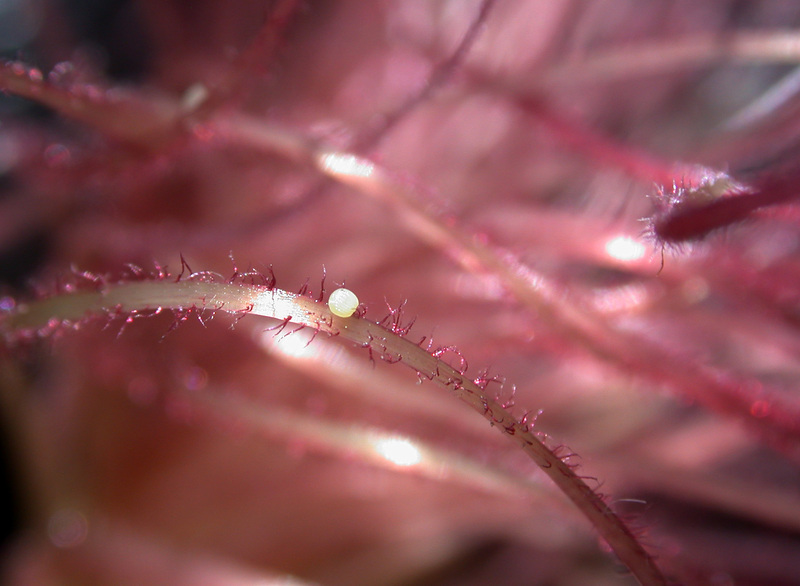 Therefore, chemical control of CEW requires very good protective coverage of the ear zone so that when the eggs hatch, the young larvae will immediately contact a lethal dose of insecticide. 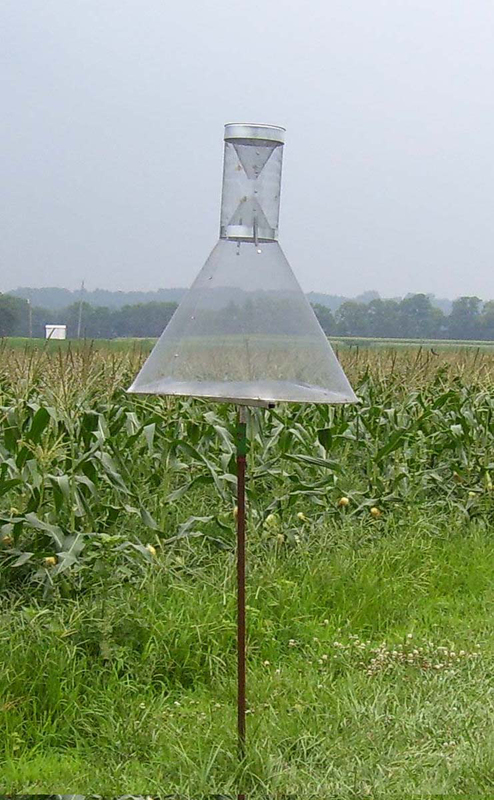 Commercial sweet corn growers are encouraged to use pheromone traps to monitor for the presence of CEW moths. 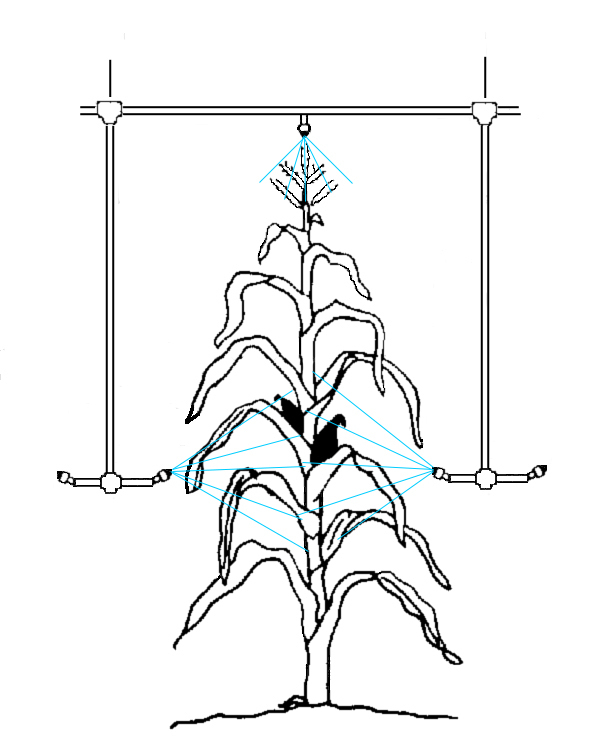 The trap should be put up just before the first crop of sweet corn begins to tassel. This recommendation is true no matter how early the first crop reaches maturity. In recent years, considerable numbers (as many as 100 per night) of earworm moths have been caught in traps very early in the season. Ideally, the trap should be located just outside the crop on the southwest corner of the field, since that is the direction the prevailing winds will blow. One trap is enough for each farm. The pheromone lure should be changed every 2-3 weeks during the season. In major corn producing states like Indiana, sweet corn is generally surrounded by many acres of dent corn. Therefore, the attractiveness of dent corn to earworm moths for egg laying has a major influence on how susceptible sweet corn is to earworm damage. Early in the season, before the neighboring dent corn begins to silk, insecticides should be applied to sweet corn when fresh silks are present and 1 moth per night is being caught in the pheromone trap. In the middle of the season when the dent corn is producing fresh silks, insecticides are not necessary unless 10 moths per night are being captured in the pheromone trap. After pollination is complete in dent corn, the spray threshold should again be reduced to 1 moth per night, because dent corn is again unattractive to the moths. For many years, sweet corn growers obtained excellent control of corn earworms with pyrethroid insecticides such as Ambush/Pounce, Asana, Baythroid, Capture/Brigade, Mustang Maxx, and Warrior. In the last several years, these products have produced unsatisfactory results because of the development of resistance to that mode of action. In recent trials, Coragen and Radiant have provided the highest levels of control. For organic growers, the only product available that provides reasonably good control is Entrust. 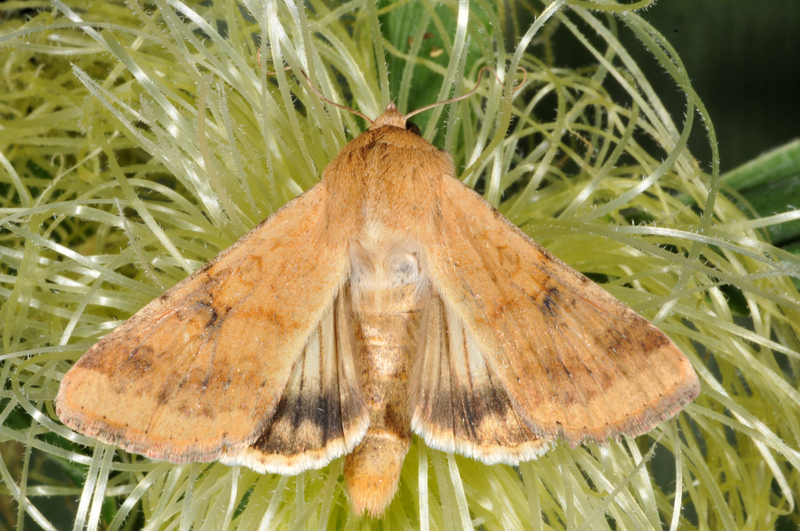 When moth catches in the pheromone trap are exceeding the threshold (1 or 10 moths per night), the first application should be made when about 30-50% of the plants are showing silks. Subsequent applications should be made every 2-5 days, depending on the number of moths being caught in the trap and the temperature, with more moths and higher temperatures shortening the interval between sprays. Moth catches will occasionally reach levels of 100 per night or higher. In these situations, the interval between sprays should be reduced to 2 days. Sprays should be continued until most of the silks have turned brown and are no longer attractive to the female moths. The reason that multiple applications are needed is not because the insecticides cease to be effective, but rather because the silks continue to grow, about 1 inch per day, leaving unprotected growth each day. Figure 1. Nozzle adjustment to apply insecticide to ear zone of the corn plant to control earworm. Water sensitive card on tip of sweet corn ear showing good spray coverage after application. There are varieties of sweet corn available that have had a gene inserted in them that cause the plant to produce the same toxin as the bacterium, Bacillus thuringiensis, or Bt. The sale of Bt sweet corn is somewhat controversial, with some consumers preferring not to eat these varieties, so be sure that your customers will purchase them before you plant them. 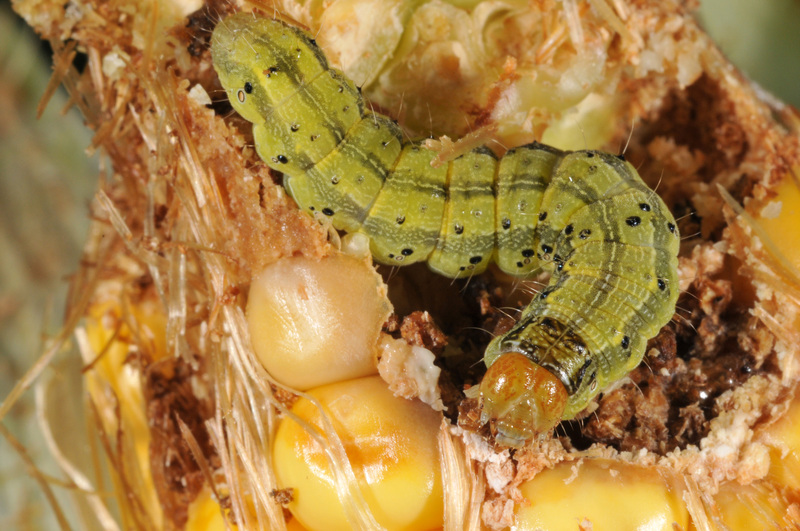 While this gene will provide some control of corn earworms, many of the varieties that contain a single Bt gene do not provide sufficient control and also require a regular insecticide spray program used with it. 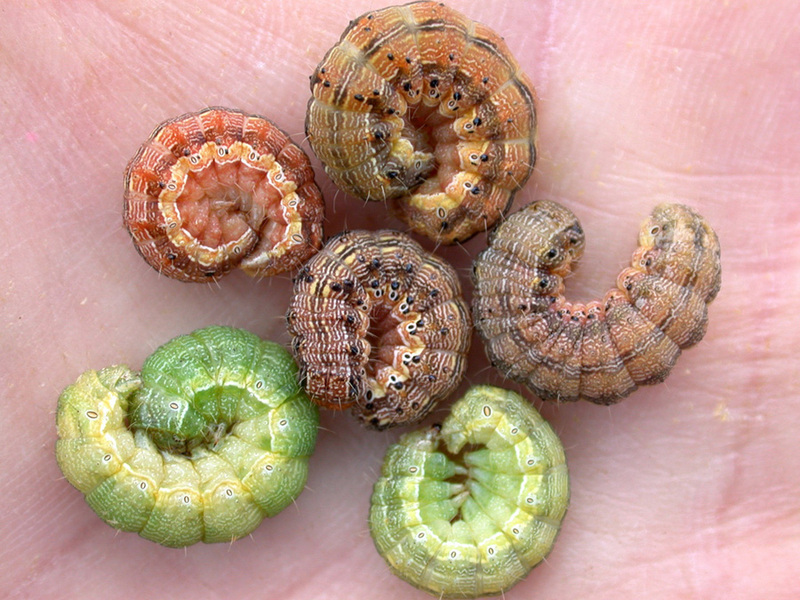 Some of the newer Bt varieties have multiple genes for earworm control (as well as control of European corn borer and other caterpillar pests) and in many situations these will provide excellent levels of control. Since moth counts in the pheromone traps are often very high late in the season, growers should consider planting Bt varieties with multiple traits in those later plantings, along with a regular spray program. Homeowners can avoid most of the damage from earworms by planting early, because sweet corn that is harvested before mid-August often will have little or no damage. Later-planted sweet corn is likely to have severe earworm damage. Homeowners should consider tolerating damage by simply cutting off the tips of damaged sweet corn ears. This will eliminate the need for using insecticides. Homeowners can use carbaryl (Sevin), permethrin, esfenvalerate, cyfluthrin, bifenthrin, cyhalothrin (lambda or gamma), and spinosad for earworm control in their home gardens. When purchasing these products at your garden center, look for the active ingredient and make sure it matches one of the above products. They may be sold under a variety of trade names, but the active ingredient listed will determine if the insecticide product will be effective for earworm control. Applying any of these materials with a 1 gallon or larger compressed air sprayer will give satisfactory results. Hold the nozzle a few inches from the silks and spray directly into them. Only spray the silks because that is where the eggs are laid. One gallon of the spray mixture should treat an area 10 X 50 feet (i.e., 3-4 rows 50 feet long). You must read and follow all label instructions. This includes directions for use, precautionary statements (hazards to humans, domestic animals, and endangered species), environmental hazards, rates of application, number of applications, reentry intervals, harvest restrictions, storage and disposal, and any specific warnings and/or precautions for safe handling of the pesticides. It is important to note that while pollinators are not necessary for pollination to occur in sweet corn, many pollinators will visit sweet corn tassels to collect pollen. Be sure to observe precautions on the insecticide label to protect those pollinators.